When writing the first book in a planned series (the sequel Dead Zone is supposed to be published this September), there's a delicate balance to maintain between telling too many of the story's secrets too early and leaving too many questions unanswered at the end. You have to give the readers enough so that they're invested and feel like they're "in" on the mystery, but not so much that they've got it all figured out all ready. Personally, I thought Blackout doled out the answers a little too slowly. 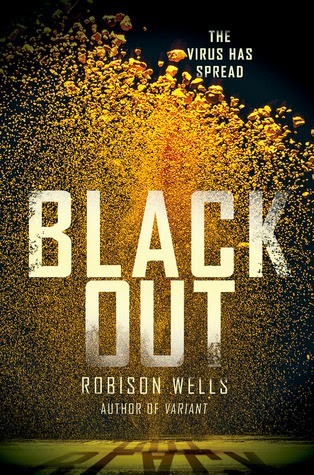 As is the case with many of these YA Speculative Fiction novels, once again we have people with superhuman abilities, this time caused by a virus called Erebus that only infects teenagers. And again, the abilities range across the board from incredible strength to invisibility to mind control to spontaneously creating heat or changing the color of objects. At least some of these infected teenagers have been organized into small three-person terrorist cells, so the government starts hunting down all infected teenagers in an attempt to both contain possible terrorists and to enlist the aid of those who aren't terrorists in fighting the terrorists. Forcibly separated from their families, two teens Jack and Aubrey learn how to control their powers - respectively hypersensitivity and invisibility via mind control - while being conscripted to fight a war they didn't even know was happening. At the beginning of the story, we learn that Jack and Aubrey used to be close friends. When Aubrey's powers started to manifest, a popular girl at school, Nicole, discovered her secret. Nicole encouraged Aubrey to use her ability for Nicole's gain, by shoplifting and spying, in return for giving her access to the "in" crowd. Consequently, Aubrey left her old friends behind only to discover later that what she needs more than anything is true friends she can trust. The character development seemed stilted to me, and there was absolutely no explanation of the terrorists' aims or goals or purpose, despite the reader accompanying them on several of their missions. There were a few inconsistencies in the use of their abilities that could probably be explained away by the teenagers' growing control over their powers, and some dipping of the toes into some philosophical questions. For example, Aubrey wonders how her using her powers to shoplift is different from the terrorists using their powers to destroy landmarks and kill people. They'd all started like she had. She'd been a normal girl until she got the virus. It hadn't taken long before she shoplifted her first thing--a box of medicine that she couldn't afford. It hadn't seemed evil...Audrey couldn't make a direct connection between shoplifting and terrorism--that was crazy--but there had to be some path, some series of bad choices...She wasn't a terrorist, but what was she? A criminal? A thief who just wasn't stealing anything at the moment?" I have to admit this was not my favorite of the nominees in the category, too many unanswered questions, not enough pulling me to the characters. I'll probably pick up the sequel when it comes out, though, if I remember to.